Screen is solid, not jaw-dropping. BoomSound speakers not as good as M8's. Watch your favourite video songs and movies in video player. It supports MP4, H.264, DivX, WMV file types. HTC has bagged itself a milestone by creating the Google flagship tablet Nexus 9.The tablet Nexus 9 comes with wifi and optional 3G/4G (LTE) sim support. Nexus 9 Tablet lowest price in India is around 29000. Following are the detailed Nexus 9 Tablet specifications and review. Nexus 9 Tablet is another modern DNA of stylish designs in the segment and has a net weight of around 430 grams, which makes it a weighted category tablet. This launch by HTC turns out to be one of the slimmest in its category by remaining restricted to a thickness of 8 mm. Nexus 9 specifications highlight an Nvidia Tegra K1 quad-core processor with a clock speed of 2.3 Ghz and 2 GB ram. It has an inbuilt memory of 16 GB for wifi version and 32 GB for 3G/LTE version. Nexus 9 Tablet battery is a non-removable 6700 mAh Li-Po setup which enables a comptitive enough battery standby. For graphic acceleration, a dedicated Kepler D1 GPU has been rested inside the core. Nexus 9 Tablet is the best call in terms of its O.S. It runs on the very latest Android v5.0 Lollipop platform and stands to be the first one to let you check the Lollipop out.This device seems to be a real benchmark by HTC in its segment. The phone includes Bluetooth v4.1 (the first device with this feature), wifi, DLNA, GLONAS and has optional 3G/4G sim support. You can buy Nexus 9 Tablet online, which sports an 8 MP autofocus primary camera with geo-tagging. The camera is accompanied by an LED flash. Daylight pictures are crisp. The camera resolution is 3264x2448 pixels. The 1.6 MP secondary camera is capable of 720p video recording. The 9 inch display is an IPS LCD display and has a resolution of 2048x1536 pixels and a multipoint capacitive touchscreen, with a great response. The display is guarded by Corning Gorilla Glass 3 to resist against scratches and screen damage. To summarize the Nexus 9 Tablet specifications and details, it is a great device for pro tablet enthusiasts. Lenovo S8 is other options worth checking out before you buy any of them. But still I’d give Nexus 9 a plus five over its rivals. Nexus 9 Tablet online price in India is 30000 approximately. For detailed online price comparison, you can hit the e-commerce markets like amazon. In its segment, and the lineage of the Nexus tabs, this device is the best of all time. Got a heavy wallet? Have no second thoughts to buy it. Android 5.0 Lollipop runs like a dream. Material Design face-lift is warm, welcoming. K1 chipset is plenty powerful, despite benchmark oddities. HTC has been out of the tablet game for a considerable amount of time, failing to earn its presence in the space, but with the arrival of the Google Nexus 9, they’ve undeniably brought together something that follows in tradition to the Nexus line. Conversely, it’s Google that takes a lot of credit, seeing that Android 5.0 Lollipop shows why it’s the most advanced tablet platform around! The pricing is absolutely competitive. Material Design gives the interface an inviting presence. Android 5.0 Lollipop dishes us several cool features. Battery is far more lasting than its contemporaries. Precise color reproduction with its display. Low lighting performance is weak with its camera. 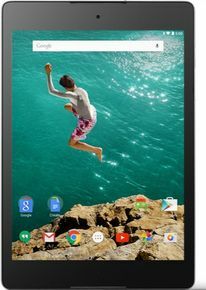 In the face of these premium tablets, the Nexus 9 quickly distinguishes itself, due to one of its greatest long-term selling points -- the latest version of Android, with subsequent consistent updates. If you're interested in a high-end Android alternative to Apple or the overly modified skins of Samsung TouchWiz or Amazon Fire tablets, take a long look at the Nexus 9. First tablet to run Android Lollipop 5.0. Switching between Different apps are fluid. Its streamlined construction has a deluxe, comfortable feel. Google Nexus 9's has a premium build, speedy performance and consistent updates. Not all apps work smoothly with Android 5.0 yet. The largest capacity model offered is 32GB and there's no microSD card slot.